When you are finished editing the page, type your edit summary and then choose "Pregledaj izmjene". 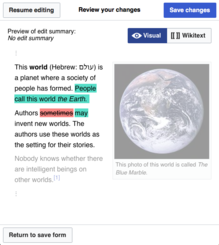 A new wikitext editing mode is available as a Beta Feature on desktop devices. 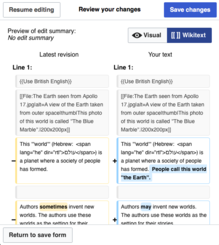 The 2017 wikitext editor has the same toolbar as the visual editor and can use the citoid service and other modern tools. Go to Special:Preferences#mw-prefsection-betafeatures to enable the Novi režim uređivanja wikiteksta. If you aren't reading this in your preferred language, then please help us with translations! Subscribe to the Translators mailing list or contact us directly, so that we can notify you when the next issue is ready. Hvala! Ova stranica je posljednji put izmijenjena na datum 7 mart 2018 u 15:46.